Joe Kramer (center) with his wife Sandy and their son Lucas. MANHATTAN, Kan. – Ducks Unlimited Special Projects Manager Joe Kramer is the winner of the 2019 Kansas Conservation Champion Award. 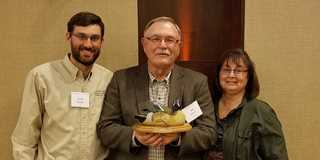 Seven Kansas natural resources societies recognized Kramer at the Kansas Natural Resources Conference. Joe worked with the Kansas Department of Wildlife, Parks and Tourism (KDWPT) for 35 years. He served as chief of the Wildlife and Fisheries Division for 26 years, working with federal agencies through numerous federal farm bills and conservation programs. When Joe retired, he began managing projects for Ducks Unlimited and is a wetland coordinator for the Kansas Alliance for Wetlands and Streams (KAWS). The award honors outstanding long-term dedication, innovation, and leadership for the conservation, protection, enhancement and stewardship of Kansas’ natural heritage and resources. Joe’s tremendous network of partners from his KDWPT career expanded and strengthened stakeholder relationships in western Kansas. His efforts facilitated record-breaking Wetlands Reserve Easement signups, enhanced the playa wetland CRP SAFE program, and expanded KDWPT’s Walk in Hunting Access. Joe has helped the state make tremendous strides in private and public land conservation.